Did Trump Happen Because Liberals Are Too Mean? Something led to Donald Trump as the Republican nominee ... liberals, maybe? Bruni argues that liberals have spent years whipping up unjustified hysteria against a series of Republican nominees who deserved far better. His examples underwhelm. “McCain was described, in some quarters, as a combustible hothead who couldn’t be allowed anywhere near the nuclear codes.” You see? Liberals said the same thing about McCain that they now say about Trump! Except, if you click on the hyperlinks, Bruni’s two examples turn out to be a random diarist at Daily Kos, a sort of open-mic blog, and Infowars, a far-right website that now supports Trump. Bruni’s examples of liberals smearing Mitt Romney do at least come from actual professional liberal commentators. But they also fall far short of the outrage he depicts. 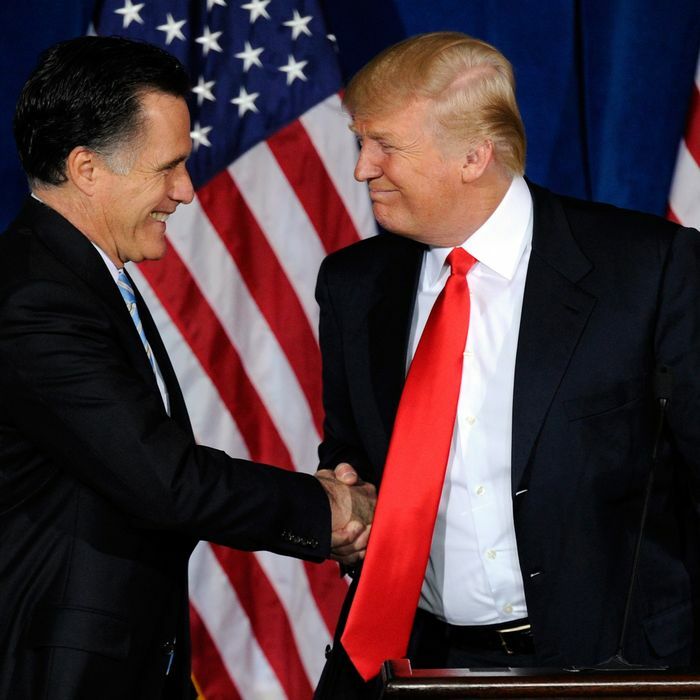 One example is Michael Tomasky denouncing Romney — who delivered a stern address to the NAACP with the apparent plan of drawing boos, so he could boast about it — as “a “race-mongering pyromaniac.” The other was Touré, who accused Romney of depicting President Obama of racial stereotyping (“niggerization”). The latter came in response to Romney calling Obama “angry” and promoting “anger and hate” and saying he should go “back to Chicago.” I’d say Tomasky’s phrase went a bit too far, and Touré’s was completely defensible, because Romney was indeed using racial coding in his own denunciation of Obama, which was wild. The latter point is important, because it merely shows that — shock! — political campaigns have people saying uncharitable things. Indeed, roughly 100 percent of the presidential elections in American history have included rhetorical excesses from some members of each side. And yet only now has Trump emerged as the nominee. So it is hard to see how liberal rhetorical excess has an important causal role. The cry-wolf theory has an obvious allure for anti-Trump conservatives who wish to absolve their movement of any responsibility for their repellent nominee. The attraction to Bruni is more fascinating. His account of Republican nominees victimized by undue criticism abruptly stops in 2008. The Republican candidate who would come next in his historical chronology, but whom Bruni omits from his narrative, is George W. Bush. Bruni covered Bush as a campaign reporter for the Times in 2000. His legendarily soft coverage struck exactly the tone Bush preferred. It ignored policy and presented the campaign as a personality contest between a goofy but lovable regular guy and a stiff, unlikable jerk. It was not enough for Vice President Al Gore to venture a crisp pronunciation of Milosevic, as in Slobodan, the Yugoslav president who refuses to be pried from power … Mr. Gore had to go a step further, volunteering the name of Mr. Milosevic’s challenger, Vojislav Kostunica. Then he had to go a step beyond that, noting that Serbia plus Montenegro equals Yugoslavia … and as Mr. Gore loped effortlessly through the Balkans, barely able to suppress his self-satisfied grin, it became ever clearer that the point of all the thickets of consonants and proper nouns was not a geopolitical lesson … it was more like oratorical intimidation, an unwavering effort to upstage and unnerve an opponent whose mind and mouth have never behaved in a similarly encyclopedic fashion. Good thing we didn’t end up with a “self-satisfied” prig who stoops to the “oratorical intimidation” of speaking in an informed way about world affairs as president! The 2001–2008 period might have been boring as hell. In a 2001 campaign memoir, Bruni half-sheepishly confessed that Bush had charmed him. (“He often seemed content to get by on as little as possible, and we perhaps focused less on this than we might have in the fall of 1999.”) Yet his memoir explains this as the by-product of Bush’s irresistible charm and comes nowhere close to grappling with what turned out to be one of the most important and consequential failures in the history of American journalism. That Bruni now accuses other journalists of crying wolf about Republican nominees is nothing short of astonishing. Bruni is like the boy who was in charge of spotting wolves, and assured everybody that it was just a bunch of adorable little puppies, and then, after the “puppies” turned out to be wolves that devoured all of the livestock and several children, wrote a book saying maybe he should have been a tad more vigilant but, hey, you gotta admit, those were some cute puppies. Liberals may be accused of many sins, but enabling Trump is not one them. Liberals have spent a quarter-century warning that the Republican Party was descending into unhinged, knee-jerk, anti-intellectual reaction. What Trump reveals is not that liberal warnings about the growing ignorance and derangement of the Republican Party were taken too seriously, but that they weren’t taken seriously enough. Update: I initially inverted the sequence of Bruni’s roles at the Times.